Since Jen Mavros and I first met in a speaker training four years ago, she has leveraged her superpower of building relationships to interview superstars like Danielle Laporte, Michael Bernard Beckwith, and Gabby Bernstein on her podcast. I chatted with Jen as a lead-up to my #StandOutChallenge when I set out to answer why some coaches have clients dying to work with them who won’t settle for anyone else while others get lost in the crowd and struggle to get clients. 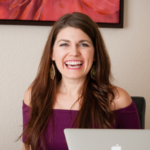 Listen to learn how Jen attracted over 5900 purpose-driven entrepreneurs, leaders, creatives, healers, coaches, and network marketers from around the world… through her mission to “love humanity forward”. What’s the next step you can take to build relationships in your business? Head over to the Unforgettable community and share it. Have you joined me on Facebook live yet? I’ve gotten on my soapbox about topics like the #1 thing you need for people to pay you thousands and taken you into my life like how I went from being burned out to excited again about my business. The best way to join me on the next one is to like my page so you get notified. P.S. 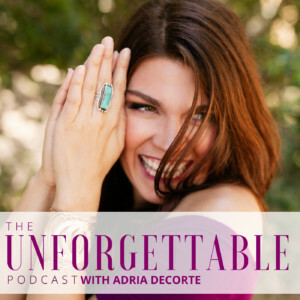 Next episode, Elizabeth DiAlto and I dig into how she’s shown up as herself, unapologetically, and cultivated clients who won’t settle for anyone else. Subscribe to the podcast so you don’t miss it! Drawing on my experience as a TEDx speaker and my architecture background, I help women coaches get clear on what they really do and communicate it so their ideal clients know why they need them and are excited to pay them. FEEL LIKE YOU HAVE TO CONVINCE PEOPLE TO HIRE YOU?